Le Moulin de Cambelong is located in a green valley at the foot of the medieval village of Conques. The hotel Moulin de Cambelong is one of the last remaining water mills on the banks of the Dourdou, a little meandering river that flows into the river Lot 3 miles downstream from there. In 2007, Hervé Busset brought one Michelin Star in Conques. In Le Moulin de Cambelong, you will find that absolute calm, comfort and well-being you are looking for. 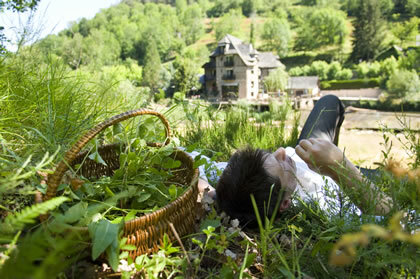 You may also wish to explore Aveyron, the River Lot gorges, and the rich local history and gastronomy. Well, it’s more like a home where we would be happy to welcome you for a time nestled in charming surroundings, serenity and well-being. We look forward to sharing the charm of this place with you, and to presenting you with the authentic and typical regional cuisine, prepared from fresh ingredients we often handpick from small producers in the valley local traditions. 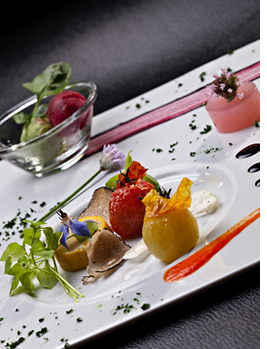 The excellent cuisine, brillantly created by Hervé Busset is based on local produce (truffles, foie gras, fillet of duck, mushrooms, trout, crayfish…). In 2007, Hervé Busset brought one Michelin Star in Conques.